Since the earliest days, God’s people thought highly of shepherds and the calling to take good care of their herds be that camels, cattle, sheep or goats. Abel was one of these and although he was brutally murdered by his very own brother, we remember him as one, whom the Lord himself was well pleased with. The patriarchs, Joseph and his brothers, Moses himself and the great king David were shepherds in the literal sense of the word and even the prophet Amos calls himself “herdsman” (Amos 7:14). Yes, these positive connections made it easy for the people of God to even identify their rulers and leaders in the spiritual and civic realms – their kings, prophets and priests – with shepherds. God himself was their good shepherd, who took good care of them always (cf. Psalm 23). However in the course of time it became clear that people in high office were disappointing. Most – if not all – failed in their high calling. Leaving God’s people rather disgruntled and disillusioned with their government and overall leadership. Yes, God himself is disgusted with the corrupt and self-serving leaders and lets his prophet Ezekiel proclaim his overall disqualification of the shepherds of his people – his very own flock and herd – his one holy Christian Church. They exploit the people instead of feeding and caring for them. The sheep look haggard, wounded and in desperate poor shape whereas the self-appointed and conceited shepherds are overweight, decorated with all sorts of finery and generally well pleased with themselves. Another aspect was that by the time of Jesus’ birth in Bethlehem, shepherds were held to be very much outside the godly fold of righteous people and holy congregation of saints. The reason for this, was that going about their calling of tending the sheep day and night prevented them from adhering to the many laws, prescriptions, rules and regulations set down by the devout, pious and law-abiding citizens of Israel. They couldn’t follow the set times of prayer, offerings and sacrifice. They were busy with dirty work outside and way beyond the boundaries of the holy city of God. 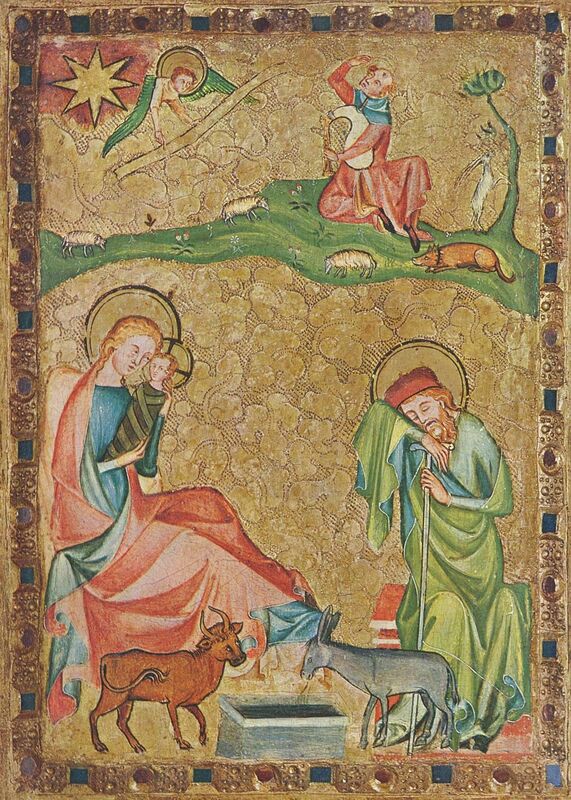 It is remarkable that God himself does not just disqualify the so-called shepherds and bad rulers of his people, but he promises to send a proper & good shepherd instead, who will do what is right in God’s eyes, tending God’s people and caring for them with grace, peace and mercy: a good shepherd, who’ll be good for the sheep, feed and care well for them, leading them to green pastures and quite waters, protecting and comforting them with his rod and staff, deterring wolves and other dangerous beasts. The sheep know his voice, they follow him and he leads them appropriately – right, meet and salutary. In the end he even lays down his life for them. It’s the one, Israel waited for over ages. So much – rather all and everything – depended on him and his coming and his good rule and care of God’s flock. With this promise of the good shepherd for Israel and the people and Church of God, he kept up their hope and confidence even though they were often tempted to despair and give up altogether. This good Shepherd is Jesus Christ. He, who at his birth was put in a manger. He, who is well know as the proper Lord and God by even the lowliest creatures like ox and donkey – even though his own people disregard and reject him! – is visited firstly by those lowly shepherds, those hirelings, who were tending their employers flocks outside in the field. They visit him, because the angelic host invited them to do so. The heavenly bands announced the life-changing message to them, that the Good Shepherd of God’s own calling, installation and ordination was finally born – right there in Bethlehem. And the shepherds go and see all that the angel told them to find out that it was indeed so. All was just as he had proclaimed. And they too spread the word about little baby Jesus, who was born to save the world. He does the work of the good shepherd from beginning to end. Preaching the Word of God to those desperately in need of both law and gospel. Condemning the wrong ways and showing the right one clearly. Binding up wounds, healing hurts and injuries, feeding, protecting, nurturing and tending all along. He is the great shepherd, who would do what it takes to redeem God’s people from sin, death and the devil. He would placate God’s wrath and grant everlasting peace and gracious favour through the very forgiveness of all our sins and by himself bearing our iniquities and burdens onto the cross, shedding his precious blood as everlasting covenant and overcoming the pangs of death and the darkness of grave and the terrors of hell. And there on the cross he pulled all towards himself – the Jews and the gentiles, those near by, but also those far off – paving the way for all to the heavenly Father and eternal salvation for even the most desperate sinners. He prayed for his killers: Father forgive them, for they don’t know, what they are doing! He promised the guilty and convicted felon with heavenly authority: Today you will be with me in paradise! This good shepherd again calls, installs and ordains shepherds (i.e. pastors) to help serve his people by preaching his Holy Word and administering his sacraments too – to create saving faith where and when it pleases God. Pastors, who are not self-serving, but tend God’s people – just like our Lord Jesus Christ admonished his apostle St.Peter: If you love me, tend my sheep/take care of my lambs. According to his holy will, grace and pastoral care, you pastors are to be made “perfect in every good work to do his will, for he works in you that which is well pleasing in his sight, through Jesus Christ; to whom be glory for ever and ever.” Amen. Savior, ne’er to leave Thee. 15. Dearest Lord, Thee will I cherish. Author: Paul Gerhardt, 1653 Translated by: Catherine Winkworth, 1858, alt. This entry was posted in Losung and Lehrtext and tagged bad, Church, Covenant, feed, Fulfilment, Good, King, perfect, Promise, Prophet, Shepherd, tend. Bookmark the permalink.